Ketchup on Your Dog? NOT in Chicago. It’s the Law. I Think. As we admired the downtown skyline, 29 cars, buses, and taxis immediately honked at us to get our Texas butts out of the road. Welcome to the City of Big Shoulders! There would be ample honking and sirens as the days progressed. Actually, as the week went on the temps smoothed out a bit, and the constant Lake Michigan breeze felt downright nice. But Chi-town its own self was quite the learning experience. 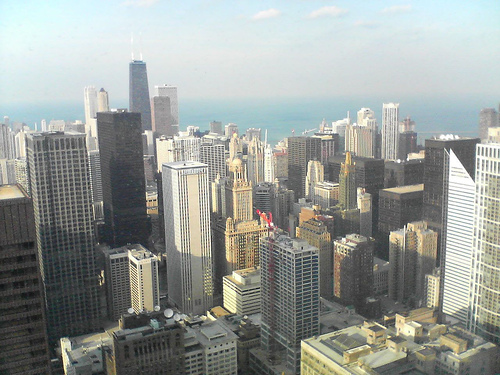 Much of the Chicago scene involves eating. It’s good eating, too, but there are rules. Statutes and laws even. 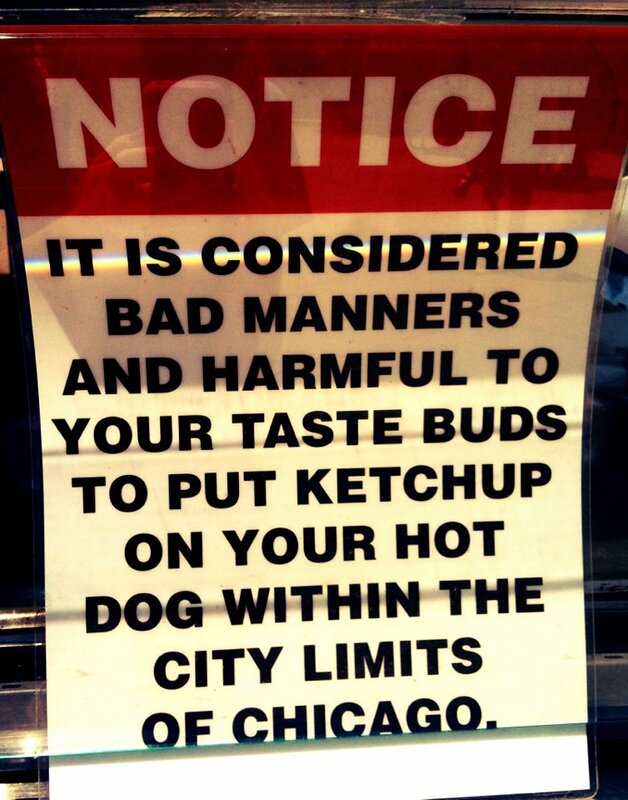 For example, under no circumstances may anyone in the greater metropolitan city limits put ketchup or any squashed-tomato-like product on a hot dog. It is strictly verboten. Vendors display large signs to this effect. Onions, relish, mustard, pickles, peppers, paprika, parsley, sage, rosemary, thyme are all fine for your frankfurter, but no ketchup. To wit, our stroll through Millennium Park near the hotel on our first day was jolted by the sight of two of Chicago’s finest cuffing a man lying face-first in the grass. Uh oh, we thought. We’d been warned to be wary of big-city crime. “What happened, officer?” I asked a backup policeman standing nearby. “K.O.D.,” the officer replied grimly. Or as part of a police sting, as the case may be. There are plenty of culinary delights besides the eponymous dog, including some of the best Italian food west of New Jersey, but, again, there are attendant rules and regulations. Please pay attention, because although the folks we met in Chicago were friendly and affable, when it comes to food they mean business. Near the famous Lincoln Park Zoo, for another e.g., there’s a terrific pub/eatery called R.J. Grunt’s. And at R.J. Grunt’s, where the proprietors claim to have invented the modern-day salad bar, you can pile everything from aardvark shavings to zinnia petals on your scrumptious salad, but if you’re caught sharing with a non-salad-bar patron—even your mom—you will be hauled off on an S.S.B. We’d been in town for a few days by the time we hit Grunt’s, so we were practically Chicagoans ourselves by this time. As they took away one particular crouton criminal, a wide-eyed tourist sidled up to me. 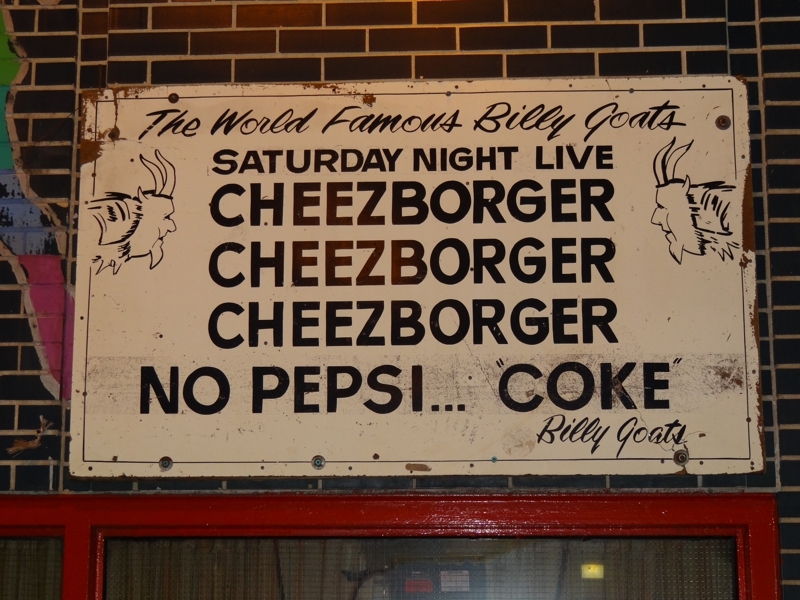 But far and away our most exciting brush with Chicago’s culinary commandments was at the one and only Billy Goat Tavern tucked under the bridge on Michigan Avenue. Yep, this is the place that inspired the classic Saturday Night Live “cheezeborger, cheezeborger, cheezeborger” skit. It’s all true. Except it’s “no Pepsi, Coke” instead of the “no Coke, Pepsi” John Belushi recited in the SNL skit. Apparently, Belushi figured “no Coke, Pepsi” sounded funnier, and who can argue his comedic brilliance? All the rest you remember from the skit is right on, however. The waitress bullied us into not only “cheezeborgers” but double “cheezeborgers” at that—and they were worth it. I’m doing a Pavlovian salivation thing right now just typing about them. And yes, there are no fries. No fries, cheeps. There’s a great big sign warning you, so you’ve only yourself to blame if you get hauled away on an F.F.T.